Soham mantra is the base of Ajapa Japa Sadhana or Soham Meditation practice. First, let us know what is Ajapa Japa. The sadhana of Ajapa Japa can be done in any meditation asana, but for the best results, the spine should be in an upright position. Siddhasana/Siddha Yoni Asana and Padmasana are the best if the Practitioner is comfortable and can sit in it for a longer period of time. One can also practice the Ajapa Japa while sitting in a chair or lying in Shavasana, but then the benefits will not be as can be achieved in the above stated preferred asanas. The practitioner can also sit in Sukhasana or Ardh-Padmasana for the practice. The traditionally used Mantra for the Ajapa Japa Sadhana is ‘Soham’ as it corresponds to the natural sounds of Inhalation and exhalation. Other Mantras like Om Namah Shivaya and Gayatri Mantra are also used by Practitioners for the practice. As stated above, Soham Mantra is the base of Ajapa Japa Sadhana and we have it for the Meditation Practice. ‘Sah’ means He, the Supreme and ‘Aham’ means I, the individual soul. So the purpose of the Soham is to remind us or the practitioner that ‘I am that’. So now we learn how to do Soham Meditation. Spread a blanket or an asana or a yoga mat on the floor. Be seated on it in any comfortable meditation posture wherein the spine can be maintained in an upright position. Allow the hands to rest on the knees in either chin mudra or jnana mudra. Close the eyes and keep them closed throughout the practice. Keep on listening to the instructions with the closed eyes. Make the head, spine, and back straight. Disconnect from the external world and stop making all physical movements for some time. Concentrate and become aware of the whole body. Try not to move your physical body. The head, spine, and neck must be in a straight line, but without straining. Maintain an unbroken and homogeneous awareness of the whole body. Become conscious of the natural and spontaneous breathing process. Feel the breath going in and coming out of the nose. Follow every breath going in and coming out and at the same time keep on listening to the instructions. When you breathe in, awaken the awareness that I am breathing in and when you breathe out, awaken the awareness that I am breathing out. Go on practicing and keep on listening to the instructions and following them. It is not mechanical or unconscious breathing but a conscious and creative breathing. The depth and speed of breath do not matter. Do not control the breath and witness it with keen awareness. Shift the awareness to the throat and feel the flow of breath in the throat zone. The Centre of awareness should be the throat, the frontal counterpart of the Vishuddhi Chakra. The breath should be normal but not nasal. It should be from the epiglottis, almost like snoring. There should be little sound as the breath is getting more and more subtle with the practice. The breath can be felt as it is not gross enough to be heard by ears. The breath should be felt continuously in the throat zone. From throat, move down to navel in a straight line. Visualize a psychic passage between the navel and the throat. Become aware of the natural breath ascending from the navel up to the throat on inhalation and descending from the throat down to the navel on exhalation. Keep on breathing in and out comfortably without making any sound. Maintain total awareness of the respiration with not a single breath passing without your awareness. The respiration should be deep and relaxed. Remain aware of the process of the breath going from the navel up to the throat and from the throat down to the navel. Awareness of the ascending and descending breath and the awareness of ‘I know’. Do not fall sideways or forwards. Do not lose track. Ascending and descending breath between the navel and the throat. Between these two points, there is no loss of consciousness even for one second. The path is the psychic path…..between the navel and the throat. Keep on practicing and listening at the same time. There is a complete awareness of breath ascending and descending between the navel and the throat. The idea of a psychic path between the navel and the throat must become very clear. More than that it is important that you are aware of it. With the awareness of breath ascending and descending, develop awareness of the sound Soham. The ascending sound is ‘So’ while the descending sound is ‘Ham’. No movement of the body should be there. You are still like a statue. Ascending breath awareness is ‘So’….and the descending breath awareness is ‘Ham’. Soham is a powerful Mantra that will make mind quiet very quickly. Keep on practicing with ascending sound….’So’…and descending sound …..’Ham’..
Now reverse the awareness to Hamso. As the psychic breath moves from throat to navel, become aware of ‘Ham’, and from navel to throat ‘So’. Practice each and every Hamso with complete awareness. Complete awareness of Hamso from throat to navel and from navel to throat with the breath descending and ascending. Remain vigilant with a constant watch over the mind and consciousness. Not at any point of time should you become absent-minded. The awareness of central point Hamso should be very strong. Better the grip on the central point ‘Hamso’, better the experience will be later on. The consciousness, which is identified with the two Mantras, should be continuous, such that the ‘So’ merges with ‘Ham’ and ‘Ham’ merges with ‘So’. Prolong the outgoing breath with sound ‘Ham’ and join it with the incoming sound vibration of ‘So’. Similarly, prolong the vibration of ‘So’ and join it with that of ‘Ham’. Thus there will be an endless circle with continuous repetition of Soham and Hamso, without any break. Become aware of the space in front of your closed eyes, called Chidakasha. ‘Chid’ means consciousness and ‘akasha’ means space. The space of consciousness is Chidakasha. In this Chidakasha, whatever is happening, just witness it, become aware of it. You might come across some shape, or some color, or even some thoughts. Just maintain a detached awareness without getting involved in any of them. Become aware of your whole body, your emotional feelings, your mind, this environment, this whole room, you and me, the guide and the subject being guided. Become aware of everything around you. Repeat aloud Om, Om, Om. You may open your eyes and move your body. The practice of Soham (Ajapa Japa) will eventually bring all hidden desires, fears, and complexes of the mind to the mental surface which are rooted into the deeper layers of mind in the form of Samskaras and Vasanas. 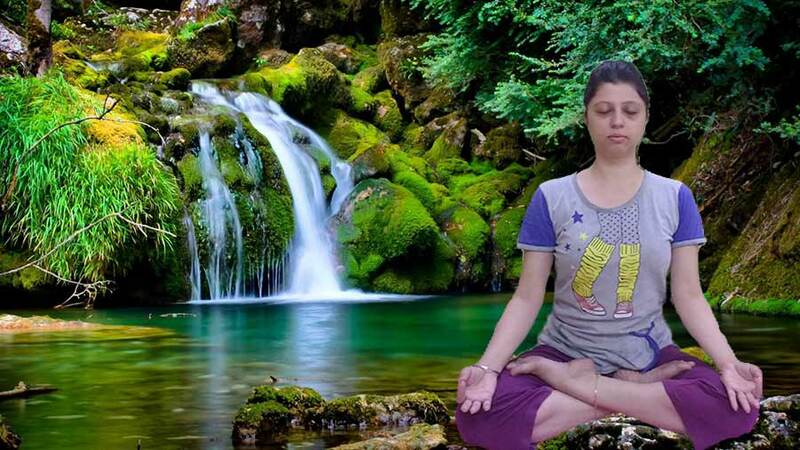 Soham Meditation relieves the mind of all tensions, benefitting the practitioner by removing the root cause of most physical and mental ailments. Soham Meditation helps us to focus and train the mind towards one-pointedness, increasing the level of concentration.